If you thought that the earthquake that struck northern California on Sunday was something, just wait until you see what is coming in the years ahead. As you will read about below, we live at a time when earthquake activity is dramatically increasing. This is especially true of the “Ring of Fire” which runs roughly along the outer perimeter of the Pacific Ocean. 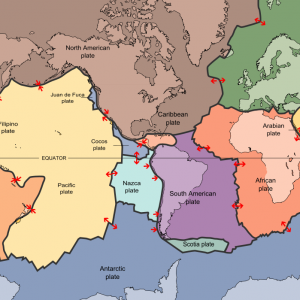 Approximately 81 percent of all big earthquakes occur along the Ring of Fire, and the entire west coast of the United States falls within the danger zone. Over the past few years, we have seen huge earthquake after huge earthquake strike various areas along the Ring of Fire, but up until now the California coastline has mostly been spared. However, there are indications that this may be about to change in a big way. Early on Sunday, a 6.1 magnitude earthquake struck the heart of wine country. It was the largest earthquake to hit northern California in 25 years. More than 120 people were injured, scores of buildings were damaged and Governor Jerry Brown declared a state of emergency. “Everything and everyone in Napa was affected by the quake. My house, along with everybody else’s, is a disaster. It looks like somebody broke in and ravaged the place, room by room.” said CNN iReporter Malissa Koven, who was awakened by the shaking at about 3:20 a.m.
That sounds pretty bad, right? The Richter magnitude scale (also Richter scale) assigns a magnitude number to quantify the energy released by an earthquake. The Richter scale is a base-10 logarithmic scale, which defines magnitude as the logarithm of the ratio of the amplitude of the seismic waves to an arbitrary, minor amplitude. As measured with a seismometer, an earthquake that registers 5.0 on the Richter scale has a shaking amplitude 10 times greater than that of an earthquake that registered 4.0, and thus corresponds to a release of energy 31.6 times greater than that released by the lesser earthquake. So don’t get too excited about what happened on Sunday. Scientists assure us that it is only a matter of time before “the Big One” hits California. In fact, the 6.1 magnitude earthquake that hit northern California on Sunday was not even the largest earthquake along the Ring of Fire this weekend. According to the U.S. Geological Survey, a 6.4 magnitude earthquake shook the area around Valparaiso, Chile on Saturday and a 6.9 magnitude earthquake struck Peru on Sunday. Something is happening that scientists don’t understand, and that is a little scary. For more than a week the earth has been rumbling beneath Iceland’s looming Bardarbunga volcano. The almost continuous small earthquakes led the government to activate its National Crisis Coordination Centre this week and block off access to the largely uninhabited region around the Bardarbunga caldera. Some scientists are saying that if that volcano erupts, it “could trigger Britain’s coldest winter ever“. That means that the shaking in California (and in much of the rest of the world) may soon get a whole lot worse.